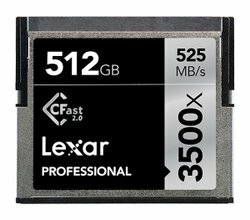 Lexar has announced its largest and most powerful CFast card yet, the 512GB Professional 3500x 2.0 Card – which will be available first quarter of 2017 with an RRP of $2550. It provides read and transfer speeds up to 525MB/s and write speeds up to 445MB/s, varying based on the set up. The card has double the memory size of the previous edition, providing cinematographers, filmmakers and photographers with the capacity and speed needed to capture 4K video and RAW photos. ‘As professional imaging technology continues to advance, it’s crucial that memory storage formats keep pace with ever-evolving data needs. When shooting 200 fps on a high-end, production-level camera, it’s easy to fill up an entire 256GB card with content in just 17 minutes,’ said Mathew Luu, marketing manager at Micron Consumer Products Group, Lexar’s parent company. ‘Comparatively, the new Professional 512GB 3500x CFast 2.0 card can capture up to more than twice that time. A lifetime copy of Image Rescue software is included for recovery of lost photo and video files, even if they were erased or the card is corrupted. Additionally the card is backed by expert tech support and a ‘limited lifetime warranty’. The CFast card is compatible with the Canon 1DX Mk II, C300 Mk II, XC10, and the BlackMagic Ursa and Mini. A version optimised for ARRI cameras, such as the Alexa and Amira, are in the works. This is the largest card, with 32GB, 64GB, 128GB, and 256GB versions also available. This entry was posted in Deck right, New Products and tagged 512GB, Lexar by Keith Shipton. Bookmark the permalink.